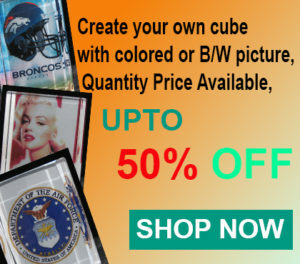 CubeCrystal.com, located in Los Angeles, California, is a family owned business and a leading provider of crystal gifts, has been serving families, schools, churches and business clients since 2007. We pride ourselves with best selections, large stocks, low prices, fast shipment, responsive customer care, and money back guarantee. We offer our customers a full ranges of gifts, awards, memorials and promotional products. Your personalized wedding gift, anniversary gift, party favors and keepsakes are made using high quality K9 crystal. Your friends, family members, and business associates will love these products! our vast range of products, including hundreds of crystal lasered cubes, crystal balls, crystal diamonds, crystal landmarks, crystal lotus flowers, crystal figurines, crystal trophies, crystal sculptures and much more, we are keeping us updated and bring new crystal gifts each year. Custom Layouts – your special gifts, awards, memory keepsakes and promotional products will be uniquely personalized based on client’s specifications. Our artists are excellent developers of layouts. Laser Etching – your custom and personalized crystal gift, award, keepsake, memorial or promotional products are professionally laser etched using green light laser, the green light laser produces the highest quality in laser etching reproduction. Our laser marking system adopts advanced laser marking technique to sculpture photos, symbols, text, and 2D or 3D images inside of transparent crystal, and not to damage the surface of the crystal, such images cannot be abolished or changed forever! We carry a large selection of empty crystal in different shape and size to give our customers a choice to engrave their own photo, logo, and text for personal portrait engraving, wedding centerpiece, corporate logos, contest awards. We understand your desire to have your custom laser etching done using the best of everything. Please do not hesitate to send us an email or call us at 626-330-8382 to discuss any questions you may have. We offer special discounts on bulk orders. Contact us to discuss your bulk order. Whether it is personal use, corporate use, church use, school use, government use, military use, whoever you are, we have the solution, and guarantee satisfaction in our products and services. We treat every customer as the biggest customer and strives to make ourselves the ultimate online superstore for crystal gifts with the widest selection and best prices.